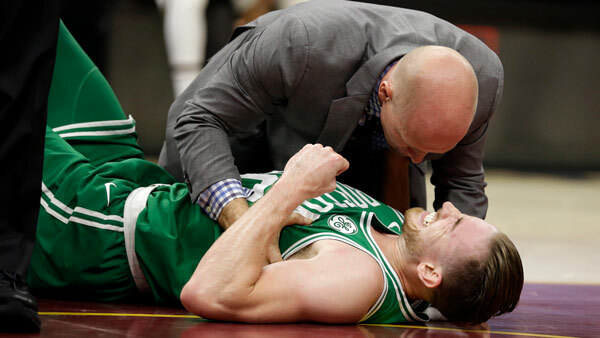 CLEVELAND -- Just five minutes into his Boston career, new Celtics star forward Gordon Hayward gruesomely broke his left ankle, an injury that may end his season. Hayward, who signed a four-year, $128 million free agent contract this summer, went up for an alley-oop pass midway through the first quarter and collided with LeBron James. Hayward's leg twisted underneath him as he came back to the floor. The 27-year-old collapsed under the basket and looked in horror as his left foot was pointing outward. He put his hands to his face and dropped back to the floor as a hush fell over the charged sellout crowd inside Quicken Loans Arena, which had come to boo Kyrie Irving in his return to Cleveland after being traded to Boston this summer. Hayward's new teammates huddled in prayer at their bench as a distressed James covered his mouth and several Cleveland players nearby looked away. Hayward had his leg placed in an air cast, and James came over and consoled him before the he was pushed from the floor on a stretcher and taken for treatment. Cleveland's crowd gave Hayward a roaring ovation as he left. The Celtics later confirmed that Hawyard's left ankle was broken. It's a devastating blow for the Celtics, who had overhauled their roster with the signing of Hayward and acquisition of Irving in hopes of closing the gap on the Cavs in the Eastern Conference. Now, they will be without Hayward for an extended period as he will likely need surgery and a lengthy rehabilitation. Hayward spent the past six seasons with the Utah Jazz before signing with Boston, where he was reunited with Brad Stevens, who coached him at Butler. Not long after Hayward went down, Oklahoma City All-Star Paul George sent encouragement to him on Twitter , asking for prayers. George overcame a similar injury when he broke his leg while playing for the U.S. national team.